Most people are surprised when I tell them that I'm working out of Google's Kirkland, WA office. 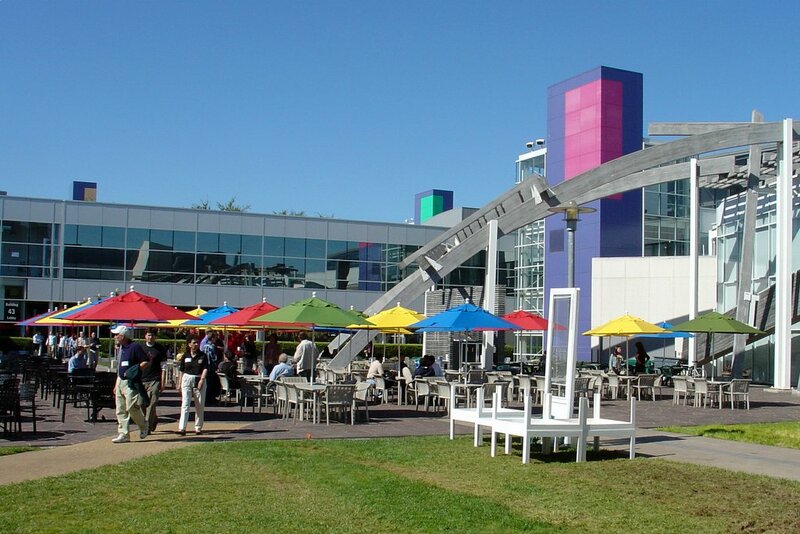 Many have no idea that Google has a presence outside of California - even including many residents of Kirkland - and the rest wonder how much interesting stuff is allowed to happen away from Google HQ. "It's much more livable [in Chicago]... I could sell my home right now and buy a shed in Silicon Valley. A small shed." "I would gladly sit through six or seven months of Chicago winter to experience fall." "I have a kid and I'd much rather raise him in Chicago. San Francisco has more pets than kids." Substitute "Kirkland" for "Chicago", and you've captured what I was thinking at the time. "While Weird Al is willing to poke fun at all races equally, his profession is an artform. We trust that our non-white audience can simply enjoy identification with being 'Nerdy'." President Bush loves "the Google"
You can watch the video over at ThinkProgress. Also, you can find the president's Crawford, TX ranch on this Google Maps search. Seeing Yahoo! in the top position was unexpected (I would have thought MSN), but it is also interesting how tightly grouped the rankings are. With a standard deviation of only 20 points, I wonder what the margin of error for the survey is. Also note the absence of ICQ and Skype. Nevertheless, as we move toward a world with IM interoperability, customer satisfaction becomes much more important, since users will be able to choose the IM network they want to use. The eventual winners will be the networks that focus on the end-users, rather than short-term monetization. The percentage of Internet users who use IM on a daily basis, 36%, was essentially unchanged from 2005, while text messaging usage continued to grow. IM replaced the use of traditional phones, to some degree, for almost 70% of IM users. You can read more details on the survey at BigBlueBall. So where exactly is Kirkland? 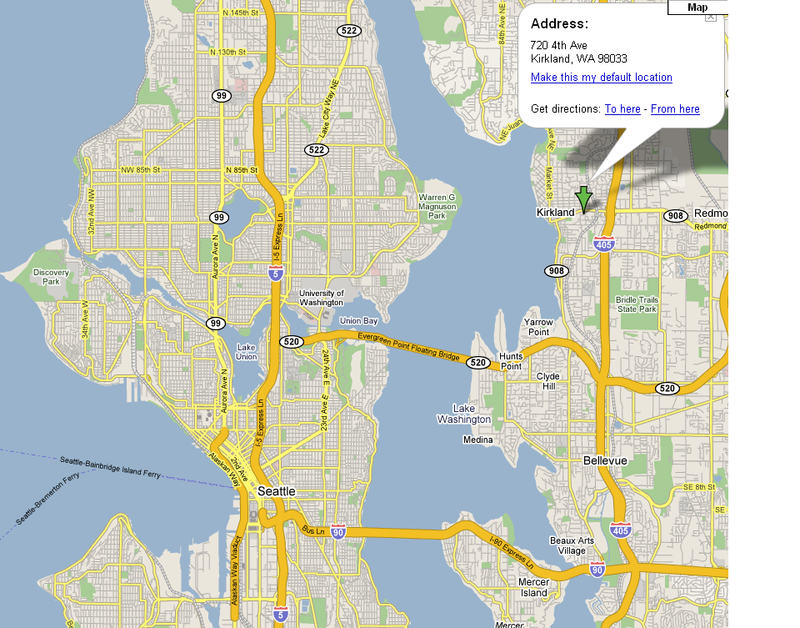 Well, Kirkland is a suburb of Seattle, just across Lake Washington (map). It's right on the lake, and with its downtown area, public waterfront, and numerous parks (including two with free wireless), there's a lot of stuff to do. It's also only about a 15-20 minute drive from Google's office in downtown Kirkland to downtown Seattle, making it (IMO) a good balance between city and suburban living. Naturally, people have their own preferences - an unscientific poll of Kirkland Googlers reveals that people without kids tend to live in Seattle, whereas those with families live in Kirkland or elsewhere on the Eastside. 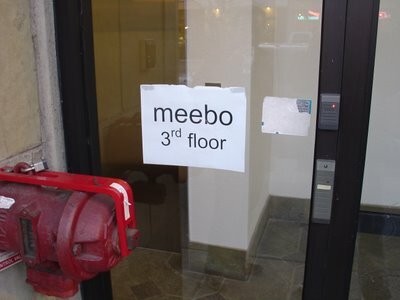 Stopped by meebo's new (and still under construction) offices in Mountain View yesterday for a non-work-related visit. Like Google, meebo is all about products that focus on a great user experience - and it's enabled them to carve out a decent niche in a space with nontrivial barriers to adoption. Just want to say thanks to everyone who wrote in to wish me well on my transition to Google. Between leaving my old job, selling our house, moving across the country, finding a new place, and starting a new job, it's been a hectic 3 weeks. I am now a Googler. It's been almost 10 years since I last started a new job, and it feels a little weird. During orientation, we were asked what terms we would use to describe Google. My choice: "colorful". More than just the choice of palette, everything (and everyone) at Google seems to have a bit of a whimsical bent. As a former co-worker once put it: "When you use a Google product, you feel like it's giving you a little hug." A warm welcome to readers of my previous blog, "Tales of a Running Man", about life at AOL and the AOL Instant Messenger system.